Matt's favorite vegetable has always been mushrooms so I made this Oven Roasted Mushroom recipe for him. And, he loved it from the first bite to the last! I didn't want it to be too complicated because side dishes should always be easy to make, but delicious enough to make it seem like it took you a long time, and this recipe is exactly that! You could probably even do it with any other vegetable you have at home, but mushrooms soak in the butter and cheese oh so perfectly. We Love Easy Side Dish Recipes, Too. Which is exactly why we created this recipe! 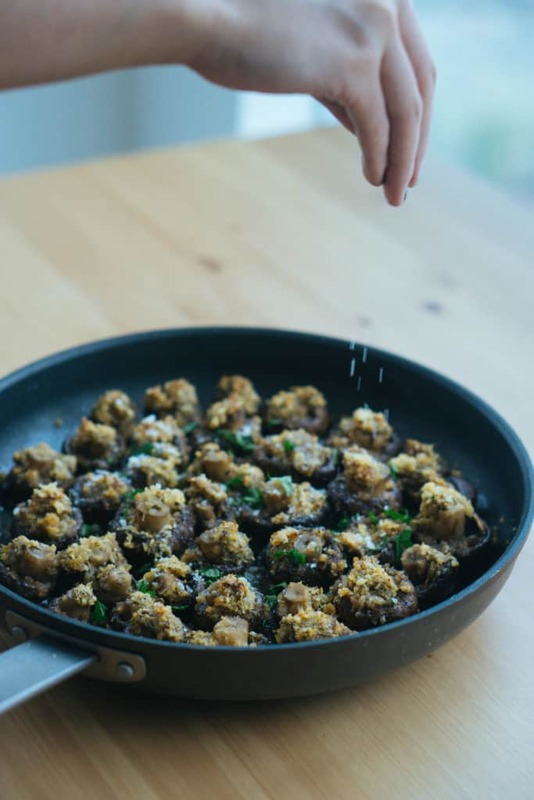 Mushrooms have never been my favorite, but if you cover anything in butter, pork rinds and Parmesan cheese, you've got me on board. It's also really easy to make and fool proof so you can whip this out any night of the week for the entire family or even for a last minute party or event you're hosting. An easy side dish recipe is everyone's best friend. Matt and I are huge into football so when football season comes around we must have appetizers ready to. Some of the best appetizers can be found at our food blog, and they are good all year round, not just football season. We've got you covered with fried goat cheese, Parmesan crisps and bacon and chive deviled eggs! That's definitely not all, but you'll have to head over to the snacks section to see the rest! This recipe definitely makes it on to the list of best keto appetizers due to its finger food and bite size qualities! ​Oven roasting vegetables is always our preferred way to cook them when making them in bulk because the clean up is easier and the oven does all the work! 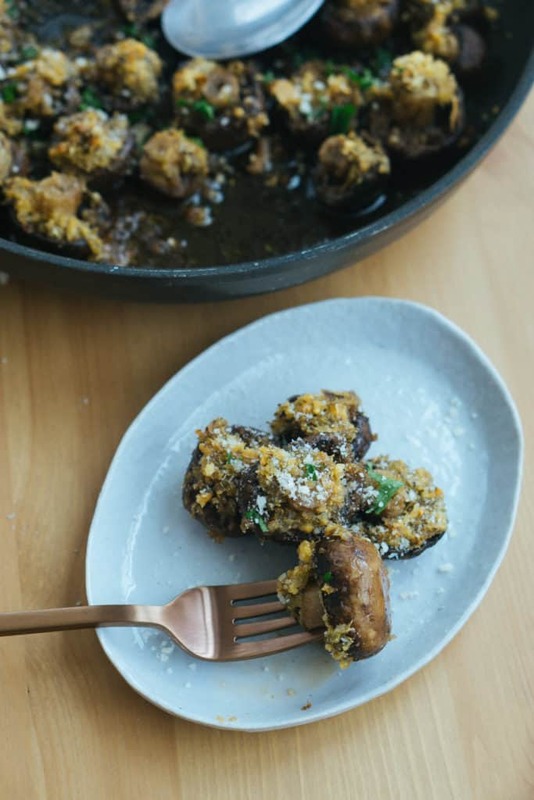 While that isn't the case here for these delicious mushrooms, the added work of sauteing them and then topping them with parmesan, garlic and pork rinds makes these oven roasted mushrooms that much more worth it! 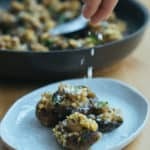 Recipe can be quickly added to MyFitnessPal - Search "KetoConnect - Oven Roasted Mushrooms"
Preheat the oven to 400 degrees and heat a large, oven safe skillet to medium high heat. Wash the mushrooms and trim the stems if too long. 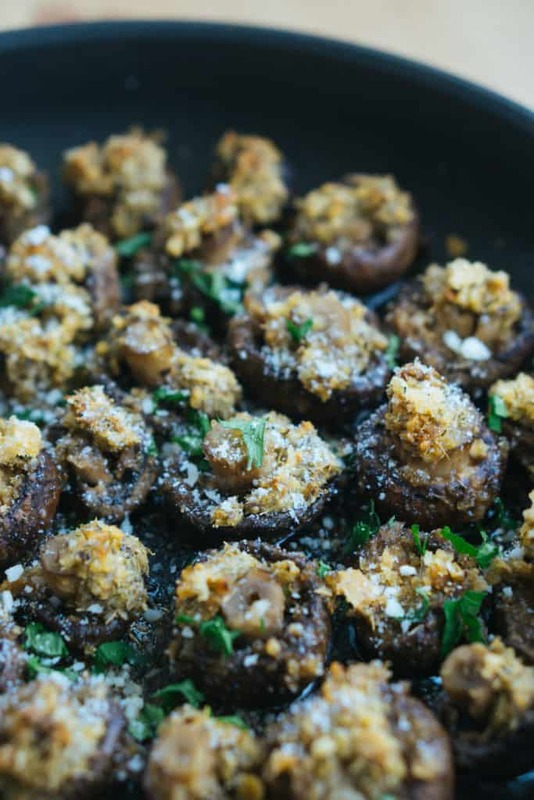 Add the olive oil to the hot pan and add in the washed and trimmed mushrooms. Saute them for 2-3 minutes and then remove from heat. Flip them all over facing the same way so the stem is facing up. In a small bowl combine the topping mixture with your hands or a spatula. Firmly press some of the topping onto each mushroom ensuring it sticks to the stem and underside. If desired, sprinkle with additional ground pork rinds and Parmesan once all have been thoroughly coated in the topping. Bake for 15 minutes. Serve immediately as a side dish or appetizer. Enjoy!